Similar in construction to our Spinthariscope, the Alpha Radioscope contains no radioactive material. Instead, the back end of the device is essentially open (covered with a metal screen). Behind this screen is an activated Zinc Sulfide (ZnS) window. The ZnS is specially prepared ( we activate it with Silver and then quench it with Copper salts at over 1500 degrees F ). This time consuming procedure makes the ZnS very sensitive to Alpha radiation. When any material that emits Alpha radiation is placed on the screen, scintillations ( flashes of light ) can be seen through the viewer. The more radioactive the sample is, the more scintillations will be visible. The Radioscope requires no batteries or power of any type, and will continue to function essentially forever. Like our Spinthariscope, the Radioscope is fabricated from a cast aluminum internal frame, high-impact plastic and steel, it will last a lifetime. The focus on the unit is adjustable. Please Note: The image above is for illustration purposes only. The Radioscope cannot be used in a brightly lit room and the sample under test must be in direct contact with the screen. This is necessary because Alpha particles only travel a little over an inch in air... and because of the low light levels involved from the scintillations, the Radioscope must be used in total darkness. 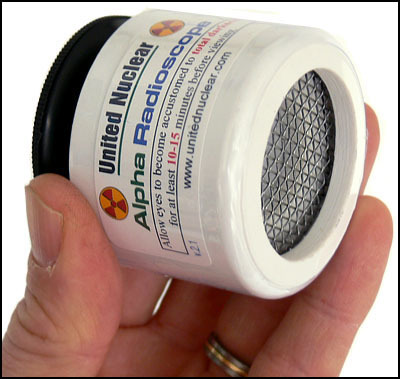 The rate & amount of flashes seen from a typical sample of Uranium ore is very low due to the minimal amount Alpha radiation emission. 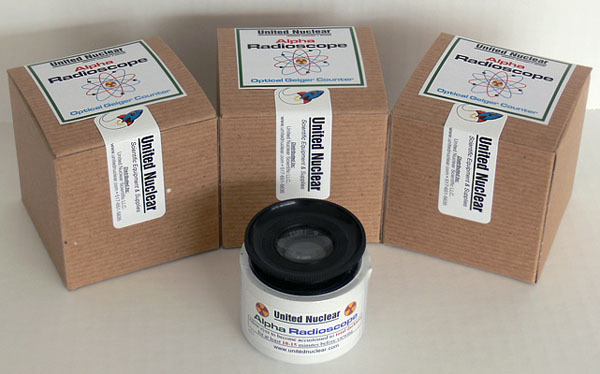 To see some real dramatic activity in the Radioscope, hold one of our Alpha emitting Isotope Source needles or disks against the Radioscope screen for an impressive light show.